For the 4th year, EiE Nigeria will provide a space for citizens to learn and share how technology helps facilitate engagement with government during Social Media Week Lagos. 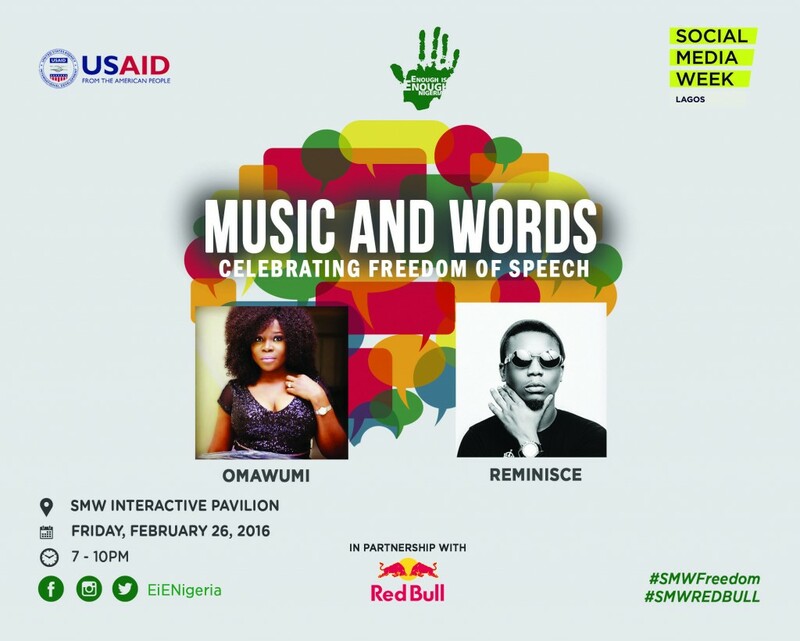 EiE will also host its 3rd annual evening of music & spoken word to celebrate the space that social media provides for freedom of expression. 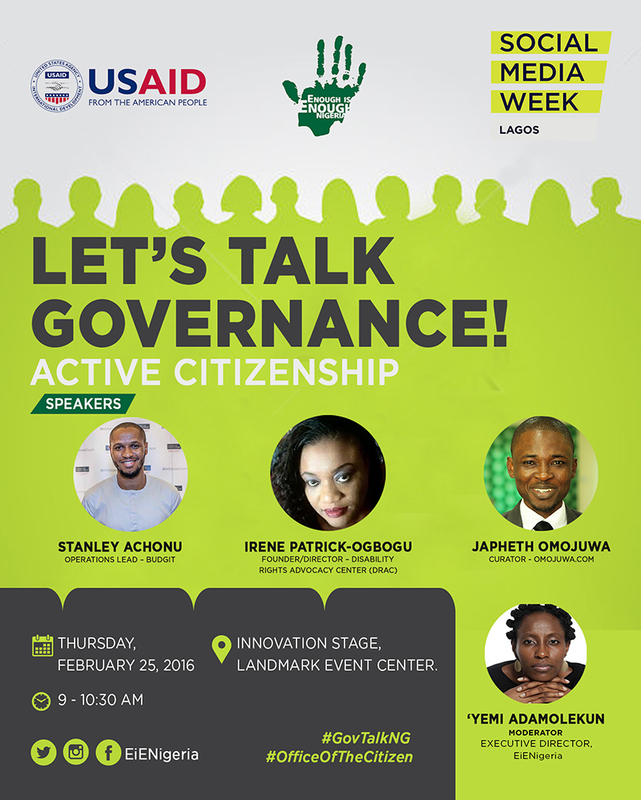 The panel on ‘Active Citizenship’ features Stanley Achonu, Operations Lead at BudgIT Nigeria, the leading organization focused on making government budgets accessible; Irene Patrick-Ogbogu of Disability Rights Advocacy Center and Japheth Omojuwa, who will look at how citizens engage government via technology. 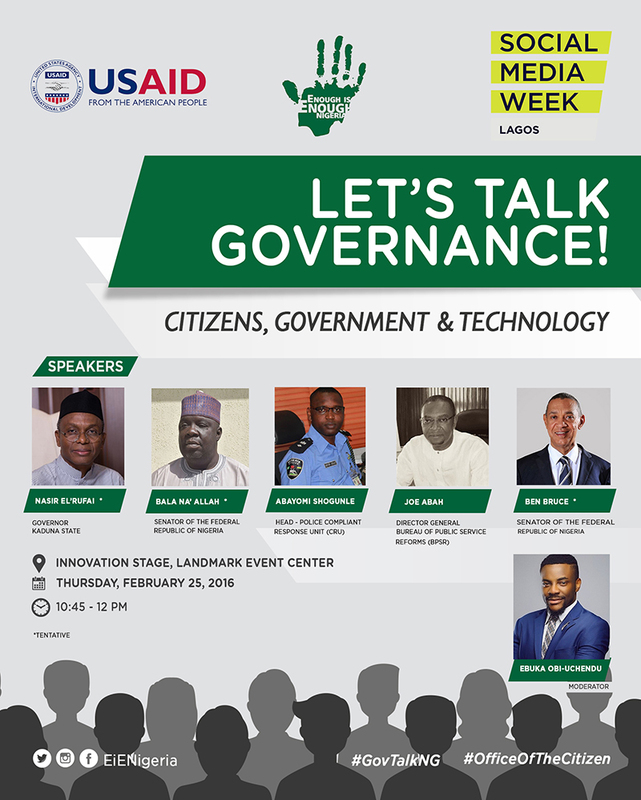 For the panel on ‘Citizens, Government & Technology’, Ebuka Obi-Uchendu will moderate a conversation by government officials on how they use technology to engage citizens. Expected at attend are: Joe Abbah, Director-General of the Bureau of Public Service Reforms and Yomi Shogunle of the Complaint Response Unit of the Nigerian Police. Mallam Nasir El-Rufai, Kaduna State Governor and Senator Ben Bruce have also been invited. 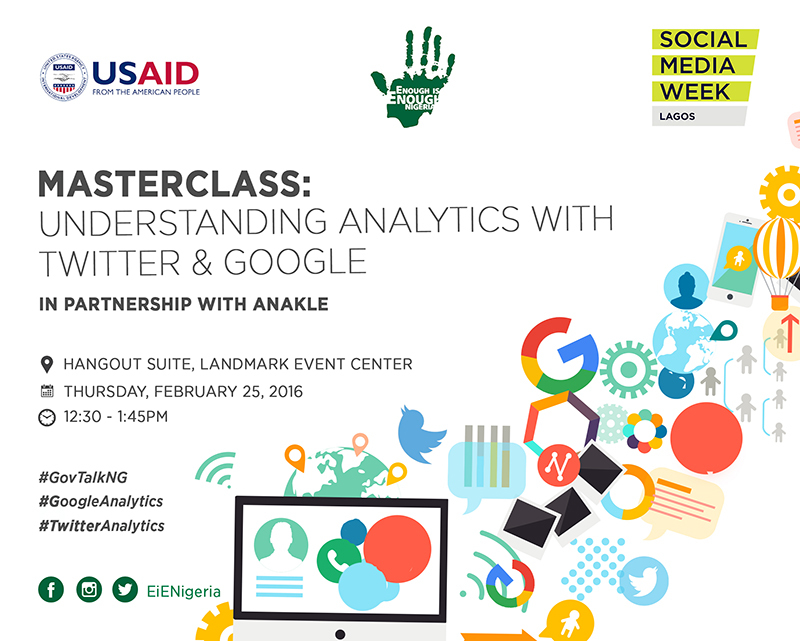 In partnership with Anakle, a digital media company, there will two masterclasses to help attendees understand how to use Facebook, Twitter & Google analytics. Finally, for Music & Words on Friday night, the powerhouse Omawumi will be joined by the lyrical maestro Reminisce as performing artistes during Red Bull’s Wrap Party. Both are RSVP Ambassadors and are active users of social media. 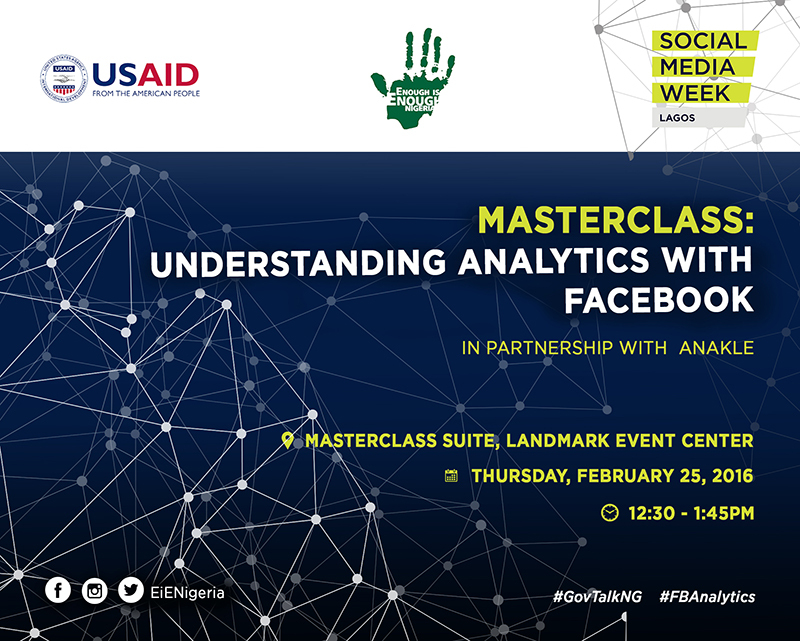 EiE’s participation at this year’s Social Media Week Lagos is supported by the USAID’s Strengthening Advocacy and Civic Engagement (SACE) project. The events will take place at the Landmark Event Center, Plot 5B Water Corporation Road, Oniru, Victoria Island, Lagos. They are free and open to the public. EnoughisEnough Nigeria (www.eie.ng). Started in 2010 and formally incorporated in 2012, EiE is Nigeria’s leading coalition of individuals and organizations focused on good governance and public accountability, which is driven through active citizenship. EiE Nigeria created the RSVP (Register|Select|Vote|Protect) Campaign to leverage technology, especially social media to mobilize significant participation from citizens in the 18-35 age bloc in the 2011 elections and beyond. As part of its 5th anniversary in 2015, it launched the #OfficeOfTheCitizen campaign focused on educating citizens on their rights and responsibilities. USAID’s Strengthening Advocacy and Civic Engagement (SACE) works to increase the capacity of citizens across the country to be more involved in the democratic reform processes. By fostering an environment of engagement and advocacy, the program helps Nigerian citizens better influence institutions whose function it is to serve public interests. This work is co-funded by the PIND Foundation in the Niger Delta.